Love is always in the air when your share your heart out and this awesome and loveable coffee mug is meant to do just that. It printed with a very adorable love sharing cartoon characters with equally cute love message. Just bring both the mugs together to see and feel the love message! 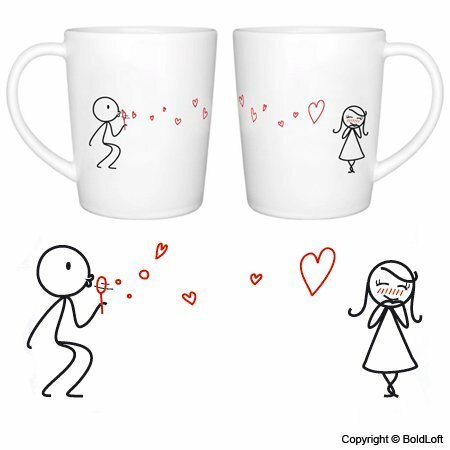 This very romantic BOLDLOFT coffee mug is made up of stoneware ceramic and comes as a set of 2 cute coffee mugs. Furthermore, after sharing a coffee with your loved one, you don’t need to wash it with your hands, its dishwasher safe! Also, its microwave safe too! It can hold 14 Oz of the beverage of your choice. Does It Makes A Perfect Gift? Well, we think that it really does make an awesome gift that can you give to anyone at their wedding anniversary or to your loved one with or without occasion. PS: It’s really is super lovable valentine gift. What We Have To Say? Priced just under $30, this is an absolute buy!! !